Merill manufactures and sells plastic products, and is committed to ensure high quality products respecting the environment. In the perspective of a continuous improvement, has defined this environmental policy. Using non-silicone mould release agent and limiting the use if not expressly needed. 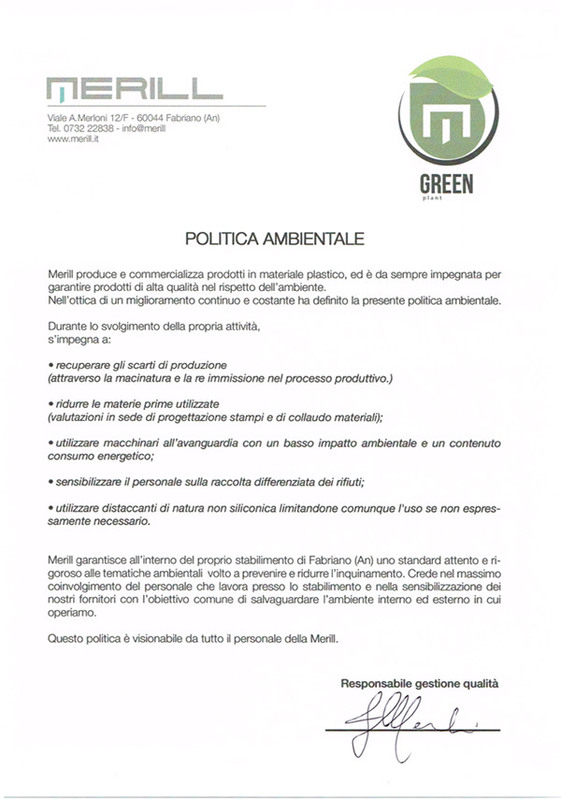 Merill guarantees inside of his factory in Fabriano (An) a careful and rigorous standard on environmental issues aimed at preventing and reducing pollution. Believes in the maximum involvement of the staff working in the plant and in the awareness of our suppliers with the common objective of safeguarding the internal and external environment in which we operate. This policy is viewable by all staff of the Merill.